Christmas maybe more than any other holiday seems designed for children--even the grown up ones. Hence how appropriate for even such an edgy company as Zombie Joe's Underground Theatre Group to put on a children's show. No, not some avant-garde version of Dr. Seus or a classic fairy tale told a la Edward Gorey or Charles Addams (not that I personally would mind any of those). But something quite straightforward and charming. 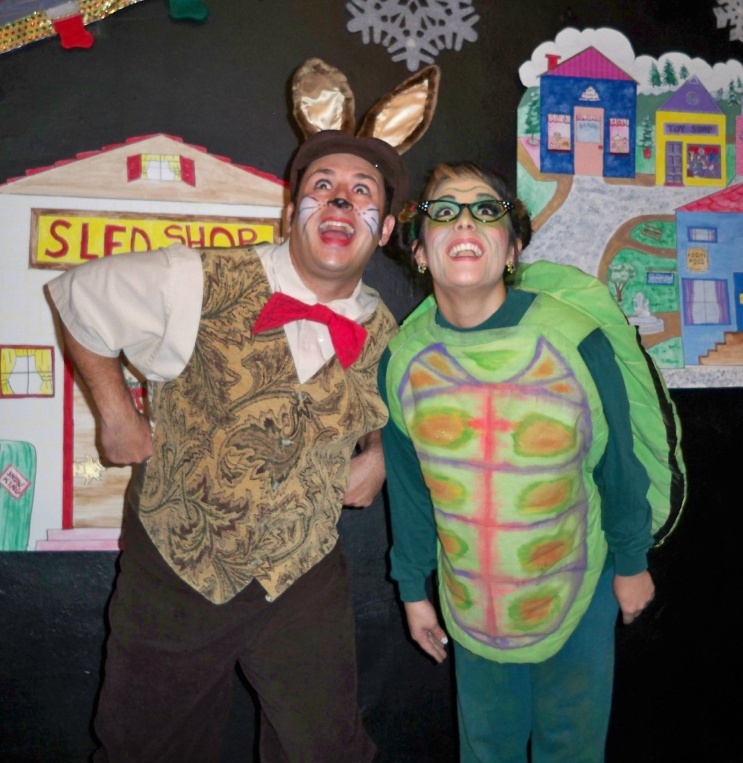 The Tortoise and the Hare Make a Holiday Wish takes place in a kind of fairy tale land of talking animals and very descriptive landmarks. We all know the classic version from Aesop's fables. The Hare is quick but flighty. The Tortoise is slow but steady. Who then will win the race? This one-act play transforms the basic premise into a longer, deeper story. Not a particularly complex one, though. One aimed squarely at those who haven't really gotten past third grade. Fortunately, I proved wise enough to attend with a dear friend who brought her grandchildren. 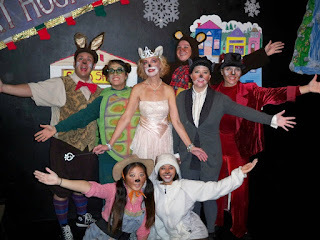 They, like the bulk of the audience, got a real kick out of this tale where everybody is getting ready to celebrate the holidays at Princess Catnip's castle (she's a feline fairly princess--a totally charming idea). Along the way, a variety of songs from such characters as a flower, a snowflake and a pair of humbugs as well as multiple animals pepper the show. At one point the Hare (Sebastian Munoz) even leads most of the audience into a dance! My friend's granddaughter was entranced! The Tortoise has frankly the harder role, at least in terms of having to keep our attention while talking and moving slowly. Caroline Montes seems pretty clearly to have had dance training because she conveyed all that in interesting ways that have little to do with natural movement. But then, this really is a live action cartoon more than anything else. A lovely little bit of live holiday cheer for the very young and the young at heart. More, something new rather than the same animated specials shown each year over and over and by now easily available on DVD or YouTube. Last summer Zombie Joe's Underground Theatre hosted Vanessa Cate's Down & Dirty Cabaret, which proved very much a success! Now, until the night of the Winter Solstice (when the Mayans supposedly said the world will end--no they didn't and how would they know anyway?) Fridays will see a sequel to the original--in this case, A Down & Dirty Christmas! Unlike the earlier show, this one features more of an actual plot and if anything manages to rise to the surreal heights for which ZJU has become known! Case in point--a character who is not only a spirit guide, but promiscuous, not only having a penchant for dressing up, but is in fact a talking snail. With a speech impediment. Essentially the whole thing is a take on Charles Dickens' A Christmas Carol, but with lots of other yuletide classics tossed in--plus lots of pretty women in lingerie. Madame Director (Vanessa Cate) is ushering in the holiday season with lots of absinthe and a snarky attitude. In contrast we see the bubbly joy of her Assistant (Natalie Hyde, who also choreographed), who manages to nag her beloved Madame Director into watching Its A Wonderful Life. The two, alas, disagree. When the Madame reaches the theatre to find her cast of beautiful, scantily clad singer/dancers dancing a la Charlie Brown's Christmas Special, she goes all Scrooge on them. She even insults her devoted, adorable Assistant! From there it becomes a spiritual quest for Madame to discover what she's lost, complete with trips back to the past and forward to the future. Much of it startlingly original! I mean, where else are you going to see a Burlesque routine done to "Carol of the Bells"? (okay that link isn't quite right, you might want to use this one instead). The most disturbing one was "I Saw Daddy Kissing Santa Claus," and it had absolutely nothing to do with the lyrics. No, it was the chorus girls. Everyone one them looking like terrified survivors of brain surgery. Dancing and smiling. Smiling and dancing. Not just the number, the whole show! Do I have anything negative to say? Well, some of the singers aren't the strongest, but none of them reach the level of bad. And one line didn't quite work. When Madame sings "Baby Its Cold Outside" to her Assistant, noting how maybe its snowing, the latter says "We're in California." Okay, I'm nitpicking but it does snow in this state. But it doesn't in Los Angeles. Hey, I said I was nitpicking, didn't I? The whole cast did a great job, the moment the lights came up on all these girls in lingerie singing "Oh Holy Night" which may be the most sincere and straightforward of all Christmas Carols. They did it straight, and very nice. And before too long they started dancing while making us laugh. Lets face it, all snarky and sarcastic about the Holidays is easy. Sincerity without straying into maudlin is frankly harder. But how about combining the snark and the sincerity without losing either one? Ah, that makes for a better accomplishment still. Most of the cast I'd seen before, in shows ranging from Not With Monsters to The Fainting Couch and Hamlet plus of course the previous Down & Dirty. Leaving the theatre, I found myself hoping for another edition, for the summer perhaps? 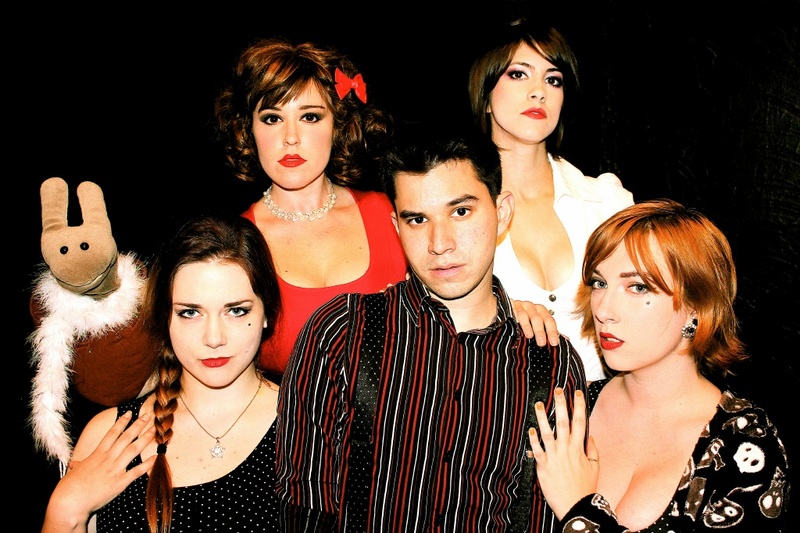 Zombie Joe's Underground Theatre Group will present A Down & Dirty Christmas at 11pm on Fridays until December 21, 2012. You can find the show at 4850 Lankershim Blvd. Phone number (818) 202-4120. All photo credits to Vanessa Cate save where otherwise noted.